You will find past and present projects and happenings in cronological order here. For more detailed info just contact Marcela. 3 February: Starting of the season at La T milonga in Malmo. Special class to all members for free. 6 February: Dj at Camarin milonga, Malmo. 2 March: Starting Tango courses in Ystad. - Place: Lancasterskolan, Klostergatan 10, Ystad. First part (six classes) : 2 march-13 April: Technique and Musicality. Second part (six classes): 20 April - 25 May: Connection and Flow. Friday 20 March/ saturday 21 March: Special course for Tango teachers Ronneby /Karlskrona. Private classes in Blekinge. 18/19 April: Special course for Tango teachers Ronneby/ Karlskrona. Private classes in Blekinge. 22 January: Starting date for private classes. 25 January: Prova pa, 21.30 -22.00. Konserthuset , Malmo. 27 January: Starting day for Tango course Ystad. Begginers, Intermediates and advanced. 28 January: first edition of the year at La T milonga in Malmo. Ungdomens Hus, Torpgatan 21, Malmo. 25 February: Starting INTENSIVE BEGGINERS COURSE, first part (six classes) Ungdomens Hus, Torpgatan 21, Malmö, tuesdays 17.30-10.30. Intermediate- Advanced, Tango Instructors seminarium, private classes. 4 March: Dj at Camarin in Malmo. 15 April: Starting course Beginners 2nd part. (6 classes, intensive) at LA T MILONGA, Ungdomens hus, Torpgatan 21, Malmo. tuesdays 17.30 - 18.30. 15 April: Starting course Giros in Tango (6 classes + 3 special classes) at LA T MILONGA, Ungdomens hus, Torpgatan 21, Malmo. tuesdays 18.30 - 19.30. 9 May: DJ at Camarin, Malmo. 13 June: Dj at Camarin tango association last milonga of the season. 15 January: Starting date for private classes. 22 January: Premiere of the year at La T milonga in Malmo. Ungdomens Hus, Torpgatan 21, sal. 12, 2nd floor. Drop in class, often with guest teachers, and thematic previously announced: 18.30-19.30. Find more info about guestt teachers and thema of the class, or special happenings at the milonga at Tangoportalen, or weekly Facebook event. Ask to be included in Facebook group La T milonga in Malmo. 24 January. 4 february: Classes in Luxembourg. Saturday 9 February: Starting date, first class, Special Tango Technique Seminary for men and women. Venue: Practica Royal, Kulturanstalten, Lyrskovgade 4, sal 2. Organized by Tangoteket, Kim Matzen. http://www.tangoteket.dk. 23 february: Connecting point in the couple, embrace. Conciousness of the space. 2 March: Energy and flow. The quality of the movement in the dance. Classes of the Seminary are in Drop in System. You do not need to register in advance. Level: To all levels, adapted to each student in a personalized way. Monday 11 February: Starting date for Tango courses in Ystad. Venue: Lankasterskolan, Klostergatan 10, Ystad. Courses organized in cooperation with Tango Ystad Association. Schedule: 10 mondays. Imtermediate-Advanced level: 18.00-19.30....Pause with refreshments for all the students in the course: 19.30-20-00.......Beginners level: 20.00-21.00. More info / Registration: Marcela marceladebuenosaires@gmail.com, tel 0735 827978........or Helga: hislandia@hotmail.com, 0411 533 491. Possibility of joining single classes in drop in system at a diferential price. Saturday 16 february: Performing in Kalskrona. Milonga with live music organized by TangobytheSea Tangokalskrona. Sunday 17 february: Group classes and private classes in Kalskrona. Saturday 9 March: Last Technique classes for women and men in Copenhagen, Thema: Energy and Flow. Practica Royal, organized by Kim Matzen. Class 12.15-13.15. After class on charge of guided practica 13.15- 16.00. Monday 8 April: Last class of Tango Course in Ystad. Friday 12 April: Starting date of TANGO - MILONGA COURSE, three classes, organized in cooperation with Camarin Tango association. Monday 13 may: Starting date of TANGO - MILONGA - VALS COURSE in Ystad, five classes, open to all levels. Friday 24 May: Special Class TANGO TECHNIQUE FOR FOLLOWERS, in cooperation with Camarin Tango Association, in Malmö. Tuesday 25 June: Last season milonga at La T.
Saturday 29 June: Landskrona dagen, trial classes and show. Monday 11 august: Starting date for Tango courses in Ystad. Schedule: 10 mondays. Imtermediate-Advanced level: 18.00-19.30....Pause with refreshments for all the students in the course: 19.30-20-00.......Begginers level: 20.00-21.00. Possibility of joining single classes (drop in system) with differential price. Tuesday 20 August: premiere winter season at La T milonga in Malmo... Open class to all level 18.30-19.30...milonga 19.30-22.15. Ungdomens hus, Torpgatan 21, Malmo. Monday 30 September: Last class of Tango course in Ystad. Saturday 12 October till sunday 20 October: Special week with Guest Teacher Marcelo Cabral from Argentina. Workshops and shows in Malmo, Ystad, Kalmar and Copenhagen. Find information and schedule in the blue menu at your left: COURSES-CLASSES-WORKSHOPS./ Classes 2013/ Special courses and weekend workshops. Saturday 12 October. Tango show at 25 års Jubileums Fest of Camarin Tango Association, Malmö, with Marcelo Cabral. Festsalen, Ungdomens Hus, Norra Skolgatan 10, Malmo. Thursday 17 October: Tango show at Cafe Rasoir, Hotel Savoy , Malmo, with Marcelo Cabral. 5 February: first Sunday drop in class at Loftet, 17.00-19.00. Hedmanska garden, Malmo. Monday 6 April: Starting date for tango course in Ystad. Lankasterskolan, Klostergatan 10, Ystad. 18.00-20.00. Ten classes. First drop in class and milonga at La T, Ungdomens Hus, Torpgatan 21, malmo. Class: 18,30-19.30....Milonga till 22.15. 14 and 21 March: special tango class at Malmo Musikhögskolan. 23 March: Dj at Camarin friday milonga. Torpgatan 21, Malmo. Thursday 29 March: first class of intensive Three classes MiILONGA COURSE, Sofielunds Folkets hus, Rolfsgatan 16. Thursdays 19.00-20.30. Sunday 1 April: Tipica Tangarte and special guest Juan Esteban Cuacci, playing live for dancing at Loftet Milonga, Hermanska garden, Malmo. Wednesday 18 april: DJ at special tango night-Milonga with Christian Zarate and Leonardo Sanchez playing live for dancing with Tipica Tangarte at Moriskan Paviljon, Folkets Park, Malmo. 19 april. Special Repetition class in Milonga course. Sofielunds Folkets Hus, Rolfsgatan 16, Malmo. 19.00-20.30. Monday 23 april: first class in Intensive MILONGA COURSE IN YSTAD,. Three classes. Mondays 18.00-20.00. 26 April: Starting date for TANGO TECHNIQUE, intensive course three classes and special class about Technique for couples. Thursdays, 19.00-20.30. Sofielunds Folkets hus, Rolfsgatan 16, Malmo. Saturday 28 april: CHACARERA WORKSHOP. Tryckeriet, Rolfsgatan 7 B. 18.00-20.30. (After: MILONGA MALENA till 02.00) In cooperation with Tango Sofielund. Friday 25 may: Dja at Camarin Tango Association. 28 May - 6 June: Luxembourg, group and private classes. 9-10 June: Intensive workshops in Kalmar, Sweden. 19-22 JULY. Classes and performance at Sitges Tango Festival 2012. 14 -16 September: classes and performance in Norway, Hardanger Fjords. 19 - 21 0ctober: classes and performance in Norway, Bergen Festivalito. 18-20 February travelling to Oslo. 24-27 March: Travelling to London. 13 April, last class at Lunds tango course. 3 May. Special class about Ganchos, at La T milonga. 18.30-19.30. Saturday 28 May, DJ in the first milonga at Hos mig, Skabersjö kulturförening. 11-18 July organizing tango trip to Sitges Tango Festival, Spain. 6 september: First milonga of the season at La T milonga, Ungdomens Hus, Torpgatan 21, Malmö. 18.30-19.30 Open all levels class with guest teachers. 19.30-22.00 milonga. 8 September: Starting date for thursdays classes at Sofielunds Folkets Hus, Malmö. 19.00-20.30. Friday 9 September: Starting date for TANGO STYLES course, in cooperation with Camarin Tango Association, Ungdomens Hus, Torpgatan 21 Malmö. 5 classes on fridays. Thema: OLD TANGO, MILONGUERO, SALON, EVOLUTION, TANGO NUEVO. Saturday 17 September: Introductory class- Show at Lunds Kulturnatten, Studieförbundet Vuxenskolan. 21.30 hs. Wednesday 28 September: Starting date for TERMIN COURSE , BEGGINERS & INTERMEDIATE / ADVANCED in LUND, with RUBEN MARIN. STUDIEFÖRBUNDET VUXENSKOLAN. 3 -9 OCTOBER: SPECIAL COURSES- WORKSHOPS in Malmö, with guest teacher JULIO MARIÑO, from Buenos Aires. Diferent thematic, different levels. 10 - 16 OCTOBER: SPECIAL CLASSES - WORKSHOPS in OSLO, with JULIO MARIÑO. Monday / tuesday 17- 18 OCTOBER: Special DJ course with MARCELO ROJAS, internationally well-known DJ from Bs. As. 20-25 October, travelling to Mallorca. Monday / tuesday 31 October- 1 November: Special Classes at Malmö Musikshögskolan. Sunday 20 November: WORKSHOP in SEQUENCES FOR SOCIAL DANCE, with RUBEN MARIN. Tryckeriet, Rolfsgatan 7 B, Malmö. 15.00- 17.00. Wednesday 30 November: Last class in Lund's Courses. 9 January. Starting weekly classes in Abbekas, Sweden. 14 January. Starting weekly drop-in classes at Sofielunds Folkets Hus, Malmo, Sweden. 19 January. Starting weekly classes at La Orillera Tango Practica. Ungdomens Hus, Malmo, Sweden. 16 February - 9 April. Travelling to Argentina. 20-24 May travelling to Berlin. 5 September, starting weekly classes at Loftet, Hedmanska Garden, Lilla Torget, Malmö, Sweden. 7 September, opening day of La T milonga, 19.30 - 22.30. 14 September: starting weekly classes , 18.30 -19.30 at Ungdomens Hus, Malmö, Sweden. 30 September till 4 October, workshops in Reikjavik, Iceland. 9 October, Performance at Lunds University with Ruben Marin- Suburbio Tango. 23 October, workshops and performance at Camarin Tango asociation milonga with Gustavo Salcedo and Orquesta El Afronte..
23 - 24 october, intensive workshop with argentinean guest teacher Gustavo Salcedo, Malmö, Sweden. 28 November- 2 January 2011: Teaching at Stockholm International Tango Festival. 9 January. Starting date for regular courses, begginers, intermediate and advanced level, in Malmö on Mondays. 24 January: Premier of La Milonga del Barrio, arranged by Marcela Troncoso and Luis Cono, in Garaget, Lönngatan 30, Malmö, from 20.00 till 01.00. 4 February: Starting date for Regular courses in Lund Loftet vuxenskolan, in cooperation with Ruben Marin from Tango Malevo. Ten classes course, once a week every thursday, in begginers and intermdediate-advance level. 7 February: year's first Milonga de los Pibes, arranged by Marcela Troncoso and Juanjo Passo, twice a season in Barnens Scen, Folkets Park, Malmö, from 20.00 till 02.00. Concert with Tipica Tangarte orchestra and then Milonga with live music from the orchestra and DJ. 28 February: Second edition of Milonga del Barrio in Garaget, Malmö. 6 March: special class and show with Victor Hugo Diaz, and Tipica Tangarte Orchestra in Medborgerhuset, Copenhagen, Denmark. 13 April: Performance in Cumbre Mundial del Tango, Bariloche , Argentina, with Alberto Goldberg. 14 April: tango show in Cumbre Mundial del Tango, Bariloche, Argentina, with Alberto Goldberg and Tipica Tangarte Orchestra. 30 April: Third edition Milonga del Barrio in Malmö, in cooperation with Tango Sofielunds. 10 May: Prova på tango: free introductory tango class, at Dunkers Kulturhus, Helsingborg. 15 May: Starting date for Tango course in Höör, open to all levels, six classes, once a week every friday from 18.30 till 20.00. 13 June - 14 June: Intensive week end courses in Malmö in cooperation with Ruben Marin, from Tango Malevo. Thematic: Colgadas and volcadas, Milonga. 11-20 July: Travelling to Barceno and Sitges, Spain. 15 August: Special Tango night organized in cooperation with Camarin tango association, at Malmö Festivalen. Class between 21.00 and 22.00. Milonga from 22.00 till 01.00. Tangarte quinteto plays for dancing. DJ: Marcela. 27-31 August: travelling to Berlin. 2 September: Prova på Tango: free introductory class for Regular courses in Loftet Vuxenskolan, Lund, in cooperation with Ruben Marin. 6 September: Season's Premier Loftet milonga, Hedmanska garden, Lilla Torget, Malmö. Class every sunday from 17.00 till 19.00 and milonga untill 23.00. 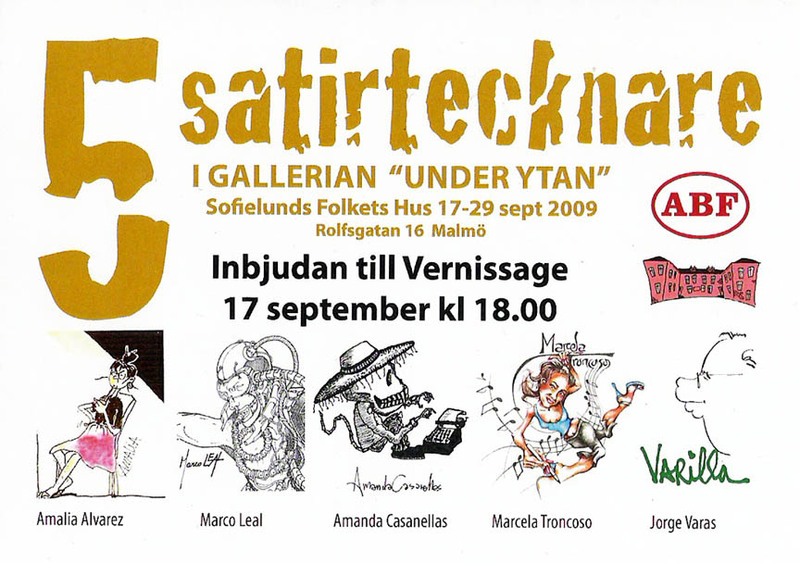 17 September: Vernissage Art exhibition with other artists from Malmö at Sofielunds Folkets Hus. 19 September: Vernissage Art Exhibition with other artists from Skåne at Lunds Libray. 19 September: Performance with Ruben Marin at Lund's Kulturnatten, in Lunds Library. 25 September: Starting date in Regular courses at Dunkers Kulturhus in Helsingborg. Seven classes course in Street tango, Begginers, and Intermediate-advanced. 26 September: Starting date for Regular tango course in Abbekås, open to all levels. Six classes course, once a week, every saturday from 10.15 till 11.45. 23 October: Workshops and Show in Gothemburg with Orlando Farias from Argentina. 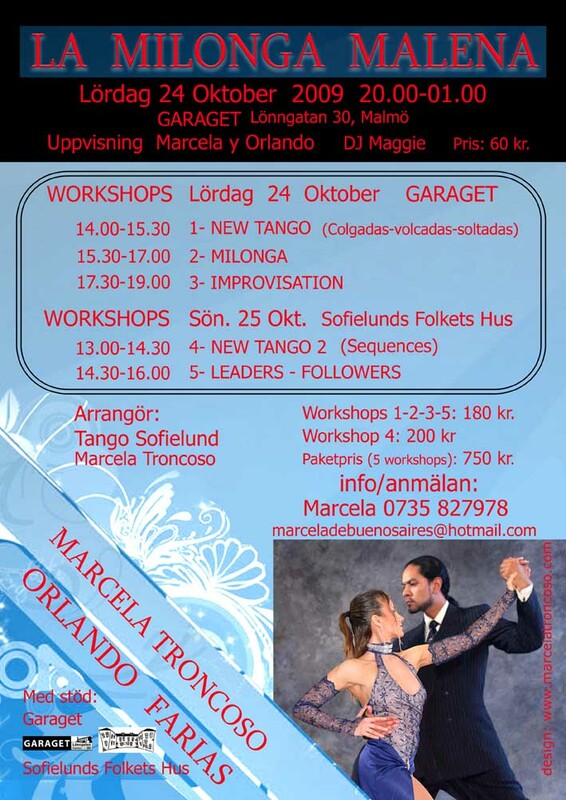 24 October: Show in La Milonga Malena, Garaget Malmo with Orlando Farias from Argentina. 24-25 October: Workshops in Garaget and Sofielunds Folkets Hus, Malmo with Orlando Farias from Argentina. 4 November: Performance at Planeta festivalen, Gothemburg. 13 November: workshops and show in Fensmark, Denmark, with Orlando Farias from Argentina. 16-23-30 November: three intensive classes course in Milonguero style, in Malmö, on mondays 20.00 -21.30..